I have a collection of plants in a pottery dish and if you can tell me what they are, I promise I'll give them the right kind of care. Your dish is great - here's the plants that I know. The top row is Sedum spurium 'Tricolor' which will be hardy for you outside, the same for the next plant which is Sedum album. Next to that is the gorgeous apricot foliage of Aeonium haworthia 'Kiwi'. The middle row is some kind of Crassula, not sure of the kind, then either one of the Echeveria or Pachyveria that are so popular. In the center is a giant bug, you may want to spray something for that. The bottom row is Echeveria runyonii 'Topsy Turvy', a small thyme variety and then a monstrose variety of Echeveria. Thanks so much for the i.d's. I'm very pleased to hear that the Sedum varieties are hardy to this area. I especially like the tricolour. Do they manage o.k. as houseplants as well? I'd like to use them as accents with tender succulents. I've tried to keep the hardy succulents such as the Sedum inside for the winter, but generally, they don't do all that well. You could try a little piece leaving the main plant outside so you have some if it doesn't make it. I find they wither and dry up, succumbing to the conditions inside. I think they prefer a good rest, out in the dormant garden for the cold months, to re-emerge refreshed in the spring. Thanks for the info. Jacki. I'm a bit disappointed as I had "plans", but your suggestion to just try a small piece indoors is a good one. Before I plant them outdoors though, I'd just like to confirm that the pink and white one (Tricolour I think you said) IS a hardy variety. I've never seen it locally. As it's my favorite, I'd hate to put it outside, then learn I misunderstood you. Do you know your climate zone? You must be about 4-5, as far as I can tell. 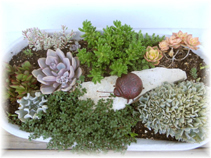 The biggest risk to any succulent plant,Sedum included in the winter is wet conditions, or changeable rain to freezing weather. If you put it in a very well drained area (raised bed, perhaps) then it should be fine. Having said that, I would hate you to lose all of the plant, so that's why I suggest splitting it to winter part of it indoors - just in case. I have a zone? O.K., in all seriousness, I know there ARE such classifications, but never HAVE understood how that works. I'll do an online search to see if I can learn where I am. I do have some succulents outdoors already, but like most of my beds, I start off all gangbusters in the spring, but with increased work loads in the summer, battling mosquitoes, and not being a huge "sun" fan, by this time of year, all the short guys are lost under a REALLY good crop of weeds. Which is why I'm so excited about container gardening. No fuss, no muss and no WEEDS. I'm off on a zoning quest.